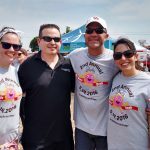 DJ Forrest performed the music and emceed the 2nd annual Shipley Do-Nut’s Dash 2016 to help support Kid’s Meals Inc. The event was a huge success with perfect weather, over 1000 participants, and lots of family friendly fun in the sun. We are excited to be a part of this amazing occasion, and are can’t wait to see this event grow bigger each year! On Saturday, May 14th, 2016, Shipley Do-Nuts will host the 2nd Annual Shipley Do-Nuts Dash. This is an exciting, family friendly fun run, to raise money to benefit Kids’ Meals Houston. Run, walk or crawl, just come out and join us for the fun! 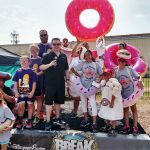 Want to win free donuts for a year? Show us what you’ve got by dressing up as you favorite donut and enter our contest for your chance to win. Registration includes a ticket to a Houston Dynamo game. Do-Nut miss out on the sweetest fun run in town! 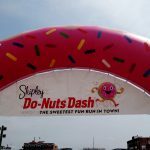 The inaugural Shipley Do-Nuts Dash was held on March 1, 2015. Through the generous support of our Dashers and Sponsors, we were able to present Kids’ Meals with a check for $10,000, to help fight poverty among underprivileged children in the Houston area. We are thrilled to partner with Kids’ Meals again and continue to help bring awareness to their mission. Kids’ Meals is a 501(c)3 non profit, community based organization, serving healthy lunches to over 1,700 hungry pre-school aged children, living in poverty. They provide and deliver nutritious meals, free of cost to the families, Monday through Friday, year-round.